The provisional Census 2011 figures published today offer some interesting insights in terms of demographic change in Ireland over the last five years. Despite speculation that population growth levels may have slowed during the Celtic Tiger era, the percentage level of population growth nationally proved to be similar to that for the 2006 Census (although this of course was covering a much shorter time period due to the postponing of the 2001 Census until 2002). 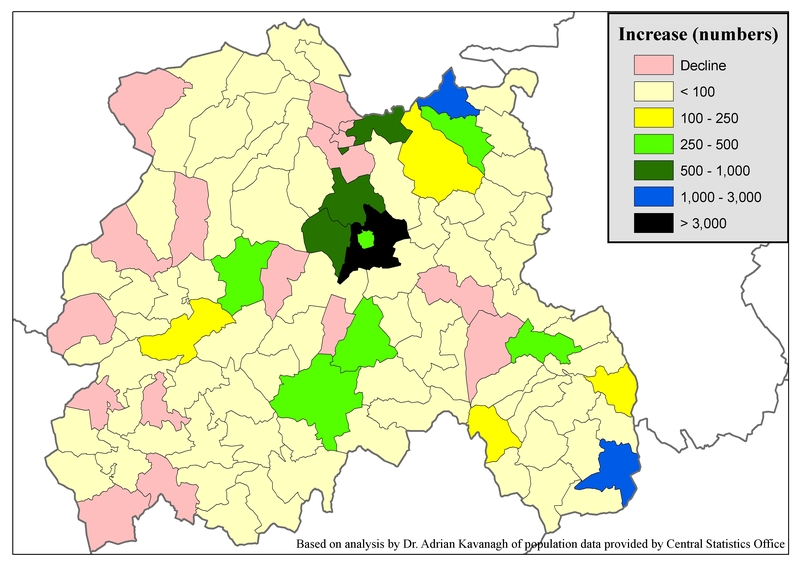 As always, there is a very definite geography to population change and population growth levels have been especially concentrated on the counties in the Dublin commuter belt, and the county to especially stand out in this regard, having experienced the greatest percentage increase in population since 2006, is Laois!!! COME ON LAOIS!!! 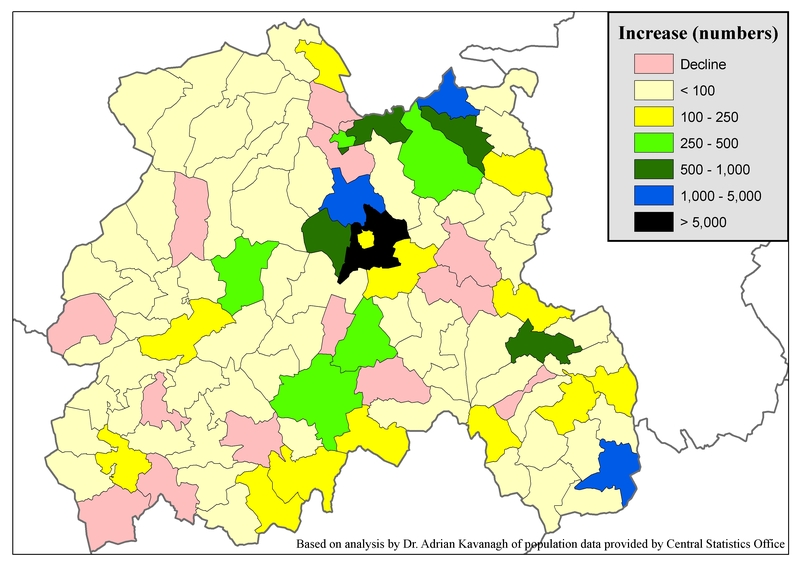 Population levels in Co. Laois increased by 8,238 between 2002 and 2006 (a 14.0% increase) and by 13,446 (20.1%) between 2006 and 2011, amounting to an increase of 21,684 (36.9%) over the past decade (or rather, the past nine years). Looking at the electoral division maps above, it can be seen that a lot of this population growth (in raw numbers) has been especially concentrated on the main urban centres in the county, all of which have been brought closer within the Dublin commuter belt in recent years by the development of the M7 and also improving rail commuter links and driven by relatively cheaper housing prices within the county, namely Portlaoise, Portarlington and Graiguecullen. 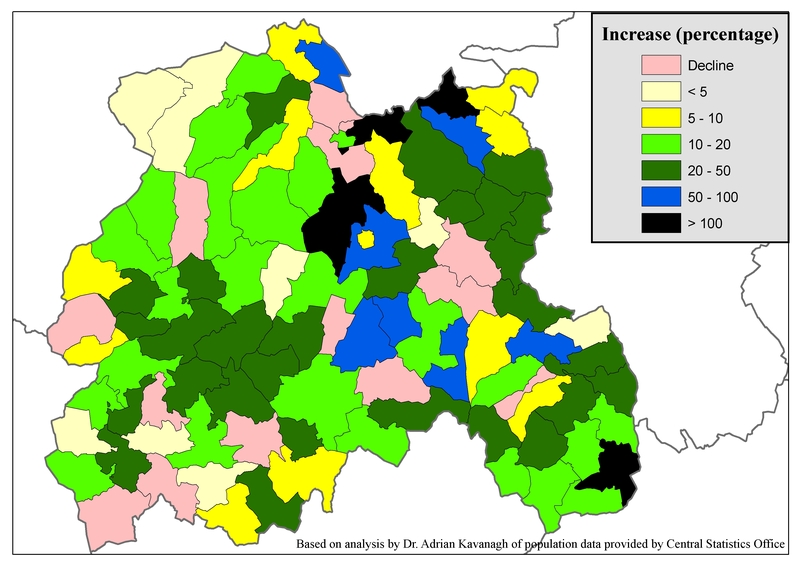 The population of the Portlaoise Rural ED for instance, as the map above shows, has grown by 5,680 (or 63.6%) since the 2002 census, with the populations of a number of other electoral divisions increasing also by close to, or over, 1,000 during this period; Borris (1,145) and Clondarrig (996) in the Portlaoise environs, Portarlington South (3,298) and Graigue Rural (2,720). Mapping the percentage population growth figures allows one to look beyond the larger/more densely populated electoral divisions and see the general geography of population increase in the county. 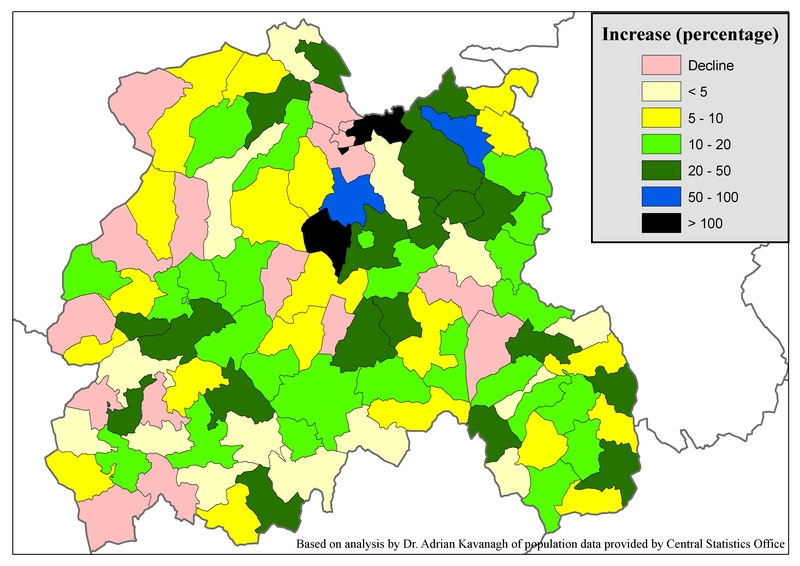 These again reflect the general trends noted when studying the raw population change numbers; of especially high growth levels in the eastern parts of the county (areas located within the Dublin commuter belt) and especially in, and around, the larger towns in this area. Looking outside these areas, the impact of commuting can be further evidenced by a strong concentration of population growth around the M7 corridor, as well as a more localised spike in population growth levels around Ballybrophy rail station in the south-west of the county. Not every area has experienced population growth however. Population has declined in the some of the electoral divisions located in the west of the county, for instance. Perhaps one final note is to suggest that it’s hard not to come to the conclusion that Laois is now Ireland’s most popular county!!! This entry was posted on June 30, 2011 at 3:21 pm and is filed under Census, Geography. You can follow any responses to this entry through the RSS 2.0 feed. You can leave a response, or trackback from your own site.